Suppose you want to send in the mail a valuable object to a friend. You have a box which is big enough to hold the object. The box has a locking ring which is large enough to have a lock attached and you have several locks with keys. However, your friend does not have the key to any lock that you have. You cannot send the key in an unlocked box since it may be stolen or copied. How do you send the valuable object, locked, to your friend - so it may be opened only by your friend? i was thinkin he could send you a lock first that he does have the key for...then you could send it to him securely. Makes sense to me. I do like dave's answer. 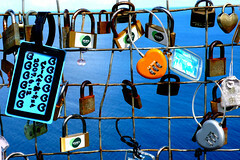 Well, like you said, one has several locks with (I'm assuming) their corresponding keys. You could lock the key in a box and send that. Then you could send the key to the box in another box. You could get a number lock and email your friend the number to the lock. I was thinking that maybe you sed locked box and put a key in another envelope and send it seperately... maybe.